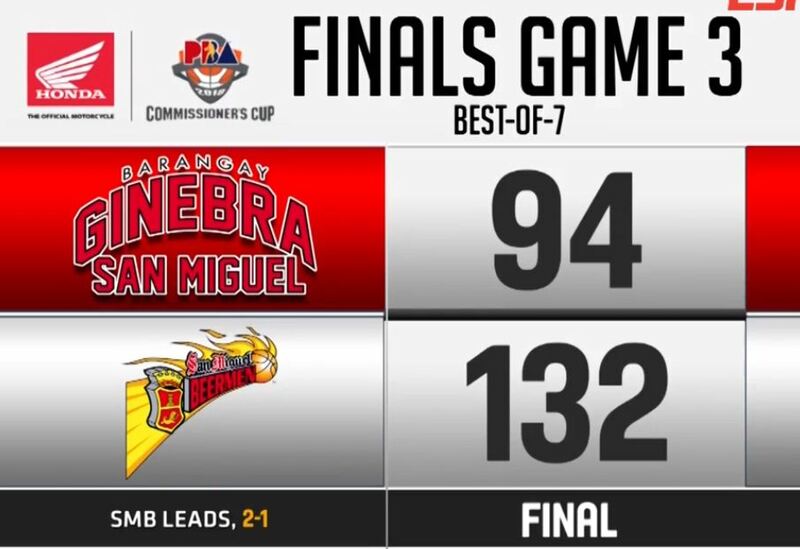 San Miguel takes a 2-1 series lead after they defeat the Ginebra on Game 3 during Finals of PBA Commissioners Cup 2018. San Miguel Beermen defeats Ginebra with the final score of 132-94 on Game 3, held at the Smart Araneta Coliseum. Next Game 4 will be on Friday, August 3, 2018, 7 pm still at the Smart Araneta Coliseum. San Miguel 132 – Balkman 28, Ross 23, Fajardo 22, Lassiter 12, Standhardinger 12, Santos 11, Cabagnot 9, Nabong 6, Pessumal 5, Heruela 4, Lanete 0. Ginebra 94 – Brownlee 32, Caguioa 12, Slaughter 9, Mercado 7, Devance 7, Tenorio 5, Mariano 5, Chan 5, Ferrer 5, Aguilar J. 4, Thompson 3, Caperal 0, Manuel 0.